Laurie Snell, the founder and long-time editor of Chance News, died on March 19. He was 86 years old. Laurie taught at Dartmouth College for 42 years until his retirement in 1995. He continued to edit the newsletter for another 10 years, and then oversaw its transformation into a Wiki, to which he remained a primary contributor. Laurie had a truly remarkable mathematical career. He completed his doctoral research on martingale theory under Joseph Doob. One of his key constructions, the “Snell envelope,” continues to find important applications in mathematical finance. His collaboration with John Kemeny at Dartmouth led to the classic treatises Finite Markov Chains and Denumerable Markov Chains (the latter also with Anthony Knapp). With Kemeny and Gerald Thompson, Laurie co-authored the ground-breaking Introduction to Finite Mathematics textbook. In the years following its publication, courses of that name became standard offerings across the country. Laurie was a great believer in the value of the Internet for sharing scholarship and teaching materials. His Introduction to Probability textbook with Charles Grinstead, and his monograph Random Walks and Electrical Networks with Peter Doyle, and are both available online. Peter has also undertaken to keep the original Introduction to Finite Mathematics materials available. Resources from the Chance Project, which under Laurie's direction grew to include a lecture series, faculty workshops, and a variety of teaching aids, are archived at the Chance Database at Dartmouth. Laurie was an ever-generous colleague, who had a gift of making everyone feel at ease in his presence. He was genuinely interested in others, and especially supportive of junior colleagues. He was a lover of music and the outdoors, and visitors to Dartmouth were invited to join in concert events, hikes in the New Hampshire mountains, and superb meals, often accompanied by his gracious wife Joan. To those who knew him and worked with him, he provided a wonderful model of all the best things about an academic life. "Self-selected samples are not much more informative than a list of correct predictions by a psychic." "[S]tatistical analysis is being used, and not always to your benefit, by everyone from your cable company to your real estate broker. Consider this your chance to fight back." "But all evolutionary biologists know that variation itself is nature's only irreducible essence. Variation is the hard reality, not a set of imperfect measures for a central tendency. Means and medians are the abstractions." The typical elementary statistics textbook is dry as dust and mostly useful as a doorstop. Andrew Vickers’ What is a p-value anyway? 34 Stories To Help You Actually Understand Statistics, consists of only 210 pages and is too thin to stop many doors but is extremely amusing, full of insight and good advice. His aim was to “write something that (a) focused on how to understand statistics, (b) avoided formulas and (c) was fun, at least in places.” And, that “is how he came with the idea of stories.” The 34 chapters are stories which are intended to illustrate statistical concepts, but are “short and fun to read.” Some of his stories may be found on Medscape.com and can be viewed once you sign on to Medscape (at no cost). You might say that the indiscriminant use of confidence intervals in scientific papers is because the authors don’t have a firm idea of what it is that they want to find out. And you might be right--I couldn’t possibly comment. [I]t is all too easy to generate endless lists of p-values using statistical software, regardless of whether any of them address a question you actually want to answer. As good as his book is, the reader will probably need some auxiliary help, perhaps by way of an organic doorstopper. Instead of a “measly” p-value of .04, suppose the p-value were far, far smaller such as 10^-35 which has been alleged in previous ESP studies. What might his reaction now be? Students may learn more statistics from reading What is p-value anyway? than from any competing statistics textbook. Do a possibly non-random sample of recently published articles in any field to determine the prevalence of those weasel words. 3. Vickers points out that “missing data is a big problem in medical research.” Imputing the value of the missing data, as might be imagined, is tricky and fraught with difficulties. One of his contributions was “to reduce the rate of missing data in the first place” by telephoning “patients at home and ask[ing] them just two question in place of a long questionnaire. In this way, we reduced the rate of missing data in a trial from 25% to 6%, which made the use of complex missing data rather redundant.” Comment on the ease of doing such pre-trial contact in this age of privacy and security. Comment on the ease of doing a post-trial contact in this age of privacy and security. 4. His definition of p-value is the standard “The p-value is the probability that the data would be at least as extreme as those observed if the null hypothesis were true.” Bayesians are unhappy with the phrase “at least as extreme” as reflected in the famous quote of Harold Jeffreys: “What the use of P[-value] implies, therefore, is that a hypothesis that may be true may be rejected because it has not predicted observable results that have not occurred.” Another famous related criticism of the use of p-value may be found via the so called optional stopping problem whereby the p-value is not unique. For some other shortcomings and possibilities for misinterpreting of p-value, see this. If these criticisms are valid, why then is p-value so ubiquitous? I generally take the position “never attribute to conspiracy what you can attribute to a simple screw-up.” Nevertheless, when you see bad statistics, it is worth wondering who stands to gain. On the other hand, read (A) White Coat Black Hat: Adventures on the Dark Side of Medicine by Carl Elliott or (B) Bad Science: Quacks, Hacks and Big Pharma Flacks by Ben Goldacre to see just how prevalent they claim conspiracies are in the medical world. •	Load up the data into the statistics software. •	Press a few buttons. •	Cut and paste the results in a word processing document. •	Look at the p-value. If p is less than .05, that is a good thing. If p >= .05, your study was a failure and probably isn’t worth sending to a scientific journal. Why is he so scornful of this approach? Many of the research papers you read will be wrong not as a result of scientific flaws, poor design or inappropriate statistics, but because of typing errors. Go to this web site to see what happened to Mizuho Securities Co. and the Tokyo Stock Exchange in December, 2005 due to a typing error. 8. He puts forward on page 193 a “rule of thumb: if you have the whole population, rather than a sample, don’t report confidence intervals and p-values.” If “we have all the data that we could get, that is, the whole population,” then “[a]ccordingly, we say these things with confidence and leave out the confidence interval.” Give several examples in which the investigator might have the entire population. 2. Notice that in the decimal expansion of pi, zero is the last digit to appear, and does not appear till the 32nd decimal place. This seems to be a long time for the last digit to appear. What is the expected place for the last digit to appear in a truly random series of digits, as the decimal expansion of transcendental numbers like pi is known to be? As posed, this becomes an application of the Coupon Collector's problem. However, it is still unknown whether π is a normal number, even though mathematicians suspect that this is true. For a class activity on empirical digit frequencies, see How normal is pi?. The question of whether the digits are "truly random" is even more subtle; for discussion see this article by Stan Wagon. Huffington Post chipped in to the March 2011 pi celebrations with an article: “Conservative Pie: Republicans Introduce Legislation Redefining Pi as Exactly 3”. The article is a spoof, but one wonders how actual many attempts there have been to redefine pi since the Indiana General Assembly's deliberations in 1897 ("pi = 3.2"). See a news story about the present article in Live Science: “Simplifying Pi? : Article a Hoax, But Hits Close to Home”. Matthew Hayat recommended the following article on the Isolated Statisticians list. Contrasts the optimistic point of view expressed in Steven Jay Gould's classic The median isn't the message with a more sobering essay, Letting go, by Atul Gawande in the New Yorker last year (8 August 2010). Supreme Court Rules Against Zicam Maker, Adam Liptak, The New York Times, March 22, 2011. Matrixx Initiaves, Inc., et al. v. Siracusano et al., U.S. Supreme Court, 2011. Investors in a company called Matrixx Initiatives got angry when they weren't told about side effect reports for that company's biggest product, Zicam. The case involved Zicam, a nasal spray and gel made by Matrixx Initiatives and sold as a homeopathic medicine. From 1999 to 2004, the plaintiffs said, the company received reports that the products might have caused some users to lose their sense of smell, a condition called anosmia. Matrixx did not disclose the reports and in 2003, the company said it was “poised for growth” and had “very strong momentum” though, by the plaintiffs’ calculations, Zicam accounted for about 70 percent of its sales. it should not have been required to disclose small numbers of unreliable reports, which were the only ones available in 2004. They added that the company should face liability for securities fraud only if the reports had been collectively statistically significant. The Supreme Court rules against Matrixx. One comment by Sonia Sotomayor was quite interesting. Additional commentary on the Supreme Court Decision can be found by Carl Bialik at the Wall Street Journal and by Scot Silverstein on the Health Care Renewal blog. 1. If statistical significance is not a standard for establishing causation, what would be the alternate standard? 2. How does the responsibility of Matrixx to its investors differ from its responsibility to its customers and to FDA? 3. What action should a company take to a small number of reports of serious side effects when those reports fail to meet the criteria of statistical significance? Statistically significant data are not always available. For example, when an adverse event is subtle or rare, “an inability to obtain a data set of appropriate quality or quantity may preclude a finding of statistical significance.” Moreover, ethical considerations may prohibit researchers from conducting randomized clinical trials to confirm a suspected causal link for the purpose of obtaining statistically significant data. A lack of statistically significant data does not mean that medical experts have no reliable basis for inferring a causal link between a drug and adverse events. The article quotes Hans Roesling, famous for his Gapminder animated data presentations, as saying "Statistics is now the sexiest subject around." Readers are probably accustomed to seeing web sites with keyword clouds that represent word frequencies by varying character size. 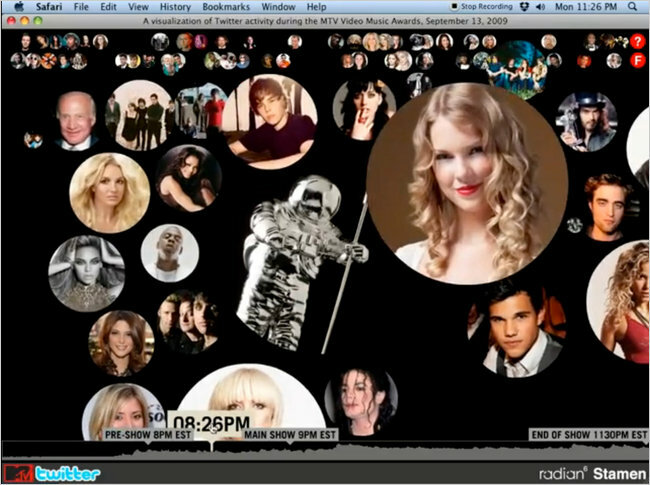 The above graphic tracks Twitter traffic during an MTV awards show, with the size of celebrities' photos representing how often they appeared in tweets. (1) for all presidential elections since 1948, R^2 = 0.15. (2) for only presidential elections since 1948 in which an incumbent president was a candidate, R^2 = 0.13. Refer to the Gas and Margin columns in the table. 1. The margin of victory declines by about how many percentage points for each dollar increase in gas price? 2. What statistic would you test in order to assess the level of significance of the relationship between the two variables? What is the value of that statistic? 3. Would you consider that statistic statistically significant? Why or why not? The U.S. fiscal situation has been getting increasing attention because of the counry's sizable and growing debt-to-GDP ratio. Many in financial markets worry that while currently manageable, the debt's increasing size, driven by a large and persistent budgetary deficit, will eventually cause a crisis for the U.S. in global bond markets. Today a major credit rating agency downgraded, for the first time, the outlook for the U.S.'s creditworthiness. While leaving the U.S. at its highest overall rating, S&P said that it was revising the country's credit outlook to "Negative", signaling the potential for a future downgrade to a lower credit rating. This would have serious implications for the interest rates the U.S. might have to pay to sell its debt. In the short term, there is the potential that S&P's downgrade could cause credit worsening, as bond buyers required higher interest rates, thus causing a near-term deterioration in U.S. finances, and thereby hastening a credit downgrade by S&P. How like is such a future downgrade? S&P said in its release today that there is a " one-in-three likelihood that we could lower our long-term rating on the U.S. within two years". Consider the probability statement made by S&P about the U.S.'s credit rating. Given that S&P is making a statement about its own future actions, actions driven in part by how markets respond to its action today, how meaningful is this probability assessment? How might you create a more credible assessment of the risk of a future downgrade? Should credit ratings agencies deal in probabilities with respect to their own future actions? This 2009 compilation is a rich source of descriptive data charts – some good, some bad. A new copy only costs about $11. This page was last edited on 20 June 2013, at 13:56.